This article is about the Intel processor brand name. For the Intel microarchitecture that is the basis for the Core 2 processor family, see Intel Core (microarchitecture). Intel Core is a line of mid- to high-end consumer, workstation, and enthusiast central processing units (CPU) marketed by Intel Corporation. These processors displaced the existing mid- to high-end Pentium processors of the time, moving the Pentium to the entry level, and bumping the Celeron series of processors to the low end. Identical or more capable versions of Core processors are also sold as Xeon processors for the server and workstation markets. As of June 2017[update], the lineup of Core processors includes the Intel Core i9, Intel Core i7, Intel Core i5, and Intel Core i3, along with the X-series Intel Core CPUs. In early 2018, news reports indicated that security flaws, referred to as "Meltdown" and "Spectre", were found "in virtually all Intel processors [made in the past two decades] that will require fixes within Windows, macOS and Linux". The flaw also affected cloud servers. At the time, Intel was not commenting on this issue. According to a New York Times report, "There is no easy fix for Spectre ... as for Meltdown, the software patch needed to fix the issue could slow down computers by as much as 30 percent". In mid 2018, the majority of Intel Core processors were found to possess a defect (the Foreshadow vulnerability), which undermines the Software Guard Extensions (SGX) feature of the processor. Although Intel Core is a brand that promises no internal consistency or continuity, the processors within this family have been, for the most part, broadly similar. The first products receiving this designation were the Core Solo and Core Duo Yonah processors for mobile from the Pentium M design tree, fabricated at 65 nm and brought to market in January 2006. These are substantially different in design than the rest of the Intel Core product group, having derived from the Pentium Pro lineage that predated Pentium 4. 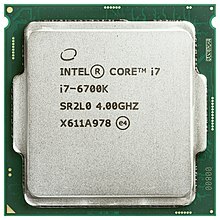 The first Intel Core desktop processor—and typical family member—came from the Conroe iteration, a 65 nm dual-core design fabricated brought to market in July 2006, based on the all-new Intel Core microarchitecture with substantial enhancements in micro-architectural efficiency and performance, outperforming Pentium 4 across the board (or near to it), while operating at drastically lower clock rates. Maintaining high instructions per cycle (IPC) on a deeply pipelined and resourced out-of-order execution engine has remained a constant fixture of the Intel Core product group ever since. The new substantial bump in microarchitecture came with the introduction of the 45 nm Bloomfield desktop processor in November 2008 on the Nehalem architecture, whose main advantage came from redesigned I/O and memory systems featuring the new Intel QuickPath Interconnect and an integrated memory controller supporting up to three channels of DDR3 memory. Subsequent performance improvements have tended toward making additions rather than profound changes, such as adding the Advanced Vector Extensions instruction set extensions to Sandy Bridge, first released on 32 nm in January 2011. Time has also brought improved support for virtualization and a trend toward higher levels of system integration and management functionality (making it faster the CPU) through the ongoing evolution of facilities such as Intel Active Management Technology. Since 2019, the Core brand has been based on 4 products, consisting of the entry level i3, the mainstream i5, the high-end i7, and the enthusiast i9. For details about the processor core, see Yonah (microprocessor). The original Core brand refers to Intel's 32-bit mobile dual-core x86 CPUs, which derived from the Pentium M branded processors. The processor family used an enhanced version of the Intel P6 microarchitecture. It emerged in parallel with the NetBurst microarchitecture (Intel P68) of the Pentium 4 brand, and was a precursor of the 64-bit Core microarchitecture of Core 2 branded CPUs. The Core brand comprised two branches: the Duo (dual-core) and Solo (Duo with one disabled core, which replaced the Pentium M brand of single-core mobile processor). The Core series is also the first Intel processor used as the main CPU in an Apple Macintosh computer. The Core Duo was the CPU for the first generation MacBook Pro, while the Core Solo appeared in Apple's Mac Mini line. Core Duo signified the beginning of Apple's shift to Intel processors across their entire line. In 2007, Intel began branding the Yonah core CPUs intended for mainstream mobile computers as Pentium Dual-Core, not to be confused with the desktop 64-bit Core microarchitecture CPUs also branded as Pentium Dual-Core. September 2007 and January 4, 2008, marked the discontinuation of a number of Core branded CPUs including several Core Solo, Core Duo, Celeron and one Core 2 Quad chip. Intel Core Solo (product code 80538) uses the same two-core die as the Core Duo, but features only one active core. Depending on demand, Intel may also simply disable one of the cores to sell the chip at the Core Solo price—this requires less effort than launching and maintaining a separate line of CPUs that physically only have one core. Intel used the same strategy previously with the 486 CPU in which early 486SX CPUs were in fact manufactured as 486DX CPUs but with the FPU disabled. Intel Core Duo (product code 80539) consists of two cores on one die, a 2 MB L2 cache shared by both cores, and an arbiter bus that controls both L2 cache and FSB (front-side bus) access. The successor to Core is the mobile version of the Intel Core 2 line of processors using cores based upon the Intel Core microarchitecture, released on July 27, 2006. The release of the mobile version of Intel Core 2 marks the reunification of Intel's desktop and mobile product lines as Core 2 processors were released for desktops and notebooks, unlike the first Intel Core CPUs that were targeted only for notebooks (although some small form factor and all-in-one desktops, like the iMac and the Mac Mini, also used Core processors). Unlike the Intel Core, Intel Core 2 is a 64-bit processor, supporting Intel 64. Another difference between the original Core Duo and the new Core 2 Duo is an increase in the amount of Level 2 cache. The new Core 2 Duo has tripled the amount of on-board cache to 6 MB. Core 2 also introduced a quad-core performance variant to the single- and dual-core chips, branded Core 2 Quad, as well as an enthusiast variant, Core 2 Extreme. All three chips are manufactured at a 65 nm lithography, and in 2008, a 45 nm lithography and support Front Side Bus speeds ranging from 533 MHz to 1600 MHz. In addition, the 45 nm die shrink of the Core microarchitecture adds SSE4.1 support to all Core 2 microprocessors manufactured at a 45 nm lithography, therefore increasing the calculation rate of the processors. The Core 2 Solo, introduced in September 2007, is the successor to the Core Solo and is available only as an ultra-low-power mobile processor with 5.5 Watt thermal design power. The original U2xxx series "Merom-L" used a special version of the Merom chip with CPUID number 10661 (model 22, stepping A1) that only had a single core and was also used in some Celeron processors. The later SU3xxx are part of Intel's CULV range of processors in a smaller µFC-BGA 956 package but contain the same Penryn chip as the dual-core variants, with one of the cores disabled during manufacturing. The majority of the desktop and mobile Core 2 processor variants are Core 2 Duo with two processor cores on a single Merom, Conroe, Allendale, Penryn, or Wolfdale chip. These come in a wide range of performance and power consumption, starting with the relatively slow ultra-low-power Uxxxx (10 W) and low-power Lxxxx (17 W) versions, to the more performance oriented Pxxxx (25 W) and Txxxx (35 W) mobile versions and the Exxxx (65 W) desktop models. The mobile Core 2 Duo processors with an 'S' prefix in the name are produced in a smaller µFC-BGA 956 package, which allows building more compact laptops. Within each line, a higher number usually refers to a better performance, which depends largely on core and front-side bus clock frequency and amount of second level cache, which are model-specific. Core 2 Duo processors typically use the full L2 cache of 2, 3, 4, or 6 MB available in the specific stepping of the chip, while versions with the amount of cache reduced during manufacturing are sold for the low-end consumer market as Celeron or Pentium Dual-Core processors. Like those processors, some low-end Core 2 Duo models disable features such as Intel Virtualization Technology. Core 2 Quad processors are multi-chip modules consisting of two dies similar to those used in Core 2 Duo, forming a quad-core processor. This allows twice the performance of a dual-core processors at the same clock frequency in ideal conditions. Initially, all Core 2 Quad models were versions of Core 2 Duo desktop processors, Kentsfield derived from Conroe and Yorkfield from Wolfdale, but later Penryn-QC was added as a high-end version of the mobile dual-core Penryn. The Xeon 32xx and 33xx processors are mostly identical versions of the desktop Core 2 Quad processors and can be used interchangeably. Core 2 Extreme processors are enthusiast versions of Core 2 Duo and Core 2 Quad processors, usually with a higher clock frequency and an unlocked clock multiplier, which makes them especially attractive for overclocking. This is similar to earlier Pentium processors labeled as Extreme Edition. Core 2 Extreme processors were released at a much higher price than their regular version, often $999 or more. With the release of the Nehalem microarchitecture in November 2008, Intel introduced a new naming scheme for its Core processors. There are three variants, Core i3, Core i5 and Core i7, but the names no longer correspond to specific technical features like the number of cores. Instead, the brand is now divided from low-level (i3), through mid-range (i5) to high-end performance (i7), which correspond to three, four and five stars in Intel's Intel Processor Rating following on from the entry-level Celeron (one star) and Pentium (two stars) processors. Common features of all Nehalem based processors include an integrated DDR3 memory controller as well as QuickPath Interconnect or PCI Express and Direct Media Interface on the processor replacing the aging quad-pumped Front Side Bus used in all earlier Core processors. All these processors have 256 KB L2 cache per core, plus up to 12 MB shared L3 cache. Because of the new I/O interconnect, chipsets and mainboards from previous generations can no longer be used with Nehalem-based processors. Intel intended the Core i3 as the new low end of the performance processor line from Intel, following the retirement of the Core 2 brand. The first Core i3 processors were launched on January 7, 2010. The first Nehalem based Core i3 was Clarkdale-based, with an integrated GPU and two cores. The same processor is also available as Core i5 and Pentium, with slightly different configurations. The Core i3-3xxM processors are based on Arrandale, the mobile version of the Clarkdale desktop processor. They are similar to the Core i5-4xx series but running at lower clock speeds and without Turbo Boost. According to an Intel FAQ they do not support Error Correction Code (ECC) memory. According to motherboard manufacturer Supermicro, if a Core i3 processor is used with a server chipset platform such as Intel 3400/3420/3450, the CPU supports ECC with UDIMM. When asked, Intel confirmed that, although the Intel 5 series chipset supports non-ECC memory only with the Core i5 or i3 processors, using those processors on a motherboard with 3400 series chipsets it supports the ECC function of ECC memory. A limited number of motherboards by other companies also support ECC with Intel Core ix processors; the Asus P8B WS is an example, but it does not support ECC memory under Windows non-server operating systems. The first Core i5 using the Nehalem microarchitecture was introduced on September 8, 2009, as a mainstream variant of the earlier Core i7, the Lynnfield core. Lynnfield Core i5 processors have an 8 MB L3 cache, a DMI bus running at 2.5 GT/s and support for dual-channel DDR3-800/1066/1333 memory and have Hyper-threading disabled. The same processors with different sets of features (Hyper-threading and other clock frequencies) enabled are sold as Core i7-8xx and Xeon 3400-series processors, which should not be confused with high-end Core i7-9xx and Xeon 3500-series processors based on Bloomfield. A new feature called Turbo Boost Technology was introduced which maximizes speed for demanding applications, dynamically accelerating performance to match the workload. The Core i5-5xx mobile processors are named Arrandale and based on the 32 nm Westmere shrink of the Nehalem microarchitecture. Arrandale processors have integrated graphics capability but only two processor cores. They were released in January 2010, together with Core i7-6xx and Core i3-3xx processors based on the same chip. The L3 cache in Core i5-5xx processors is reduced to 3 MB, while the Core i5-6xx uses the full cache and the Core i3-3xx does not support for Turbo Boost.Clarkdale, the desktop version of Arrandale, is sold as Core i5-6xx, along with related Core i3 and Pentium brands. It has Hyper-Threading enabled and the full 4 MB L3 cache. According to Intel "Core i5 desktop processors and desktop boards typically do not support ECC memory", but information on limited ECC support in the Core i3 section also applies to Core i5 and i7. Intel Core i7 as an Intel brand name applies to several families of desktop and laptop 64-bit x86-64 processors using the Nehalem, Westmere, Sandy Bridge, Ivy Bridge, Haswell, Broadwell, Skylake, and Kaby Lake microarchitectures. The Core i7 brand targets the business and high-end consumer markets for both desktop and laptop computers, and is distinguished from the Core i3 (entry-level consumer), Core i5 (mainstream consumer), and Xeon (server and workstation) brands. Intel introduced the Core i7 name with the Nehalem-based Bloomfield Quad-core processor in late 2008. In 2009 new Core i7 models based on the Lynnfield (Nehalem-based) desktop quad-core processor and the Clarksfield (Nehalem-based) quad-core mobile were added, and models based on the Arrandale dual-core mobile processor (also Nehalem-based) were added in January 2010. The first six-core processor in the Core lineup is the Nehalem-based Gulftown, which was launched on March 16, 2010. Both the regular Core i7 and the Extreme Edition are advertised as five stars in the Intel Processor Rating. In each of the first three microarchitecture generations of the brand, Core i7 has family members using two distinct system-level architectures, and therefore two distinct sockets (for example, LGA 1156 and LGA 1366 with Nehalem). In each generation, the highest-performing Core i7 processors use the same socket and QPI-based architecture as the medium-end Xeon processors of that generation, while lower-performing Core i7 processors use the same socket and PCIe/DMI/FDI architecture as the Core i5. "Core i7" is a successor to the Intel Core 2 brand. Intel representatives stated that they intended the moniker Core i7 to help consumers decide which processor to purchase as Intel releases newer Nehalem-based products in the future. In early 2011, Intel introduced a new microarchitecture named Sandy Bridge. This is the second generation of the Core processor microarchitecture. It kept all the existing brands from Nehalem, including Core i3/i5/i7, and introduced new model numbers. The initial set of Sandy Bridge processors includes dual- and quad-core variants, all of which use a single 32 nm die for both the CPU and integrated GPU cores, unlike the earlier microarchitectures. All Core i3/i5/i7 processors with the Sandy Bridge microarchitecture have a four-digit model number. With the mobile version, the thermal design power can no longer be determined from a one- or two-letter suffix but is encoded into the CPU number. Starting with Sandy Bridge, Intel no longer distinguishes the code names of the processor based on number of cores, socket or intended usage; they all use the same code name as the microarchitecture itself. Ivy Bridge is the codename for Intel's 22 nm die shrink of the Sandy Bridge microarchitecture based on tri-gate ("3D") transistors, introduced in April 2012. Released on January 20, 2011, the Core i3-2xxx line of desktop and mobile processors is a direct replacement of the 2010 "Clarkdale" Core i3-5xx and "Arrandale" Core i3-3xxM models, based on the new microarchitecture. While they require new sockets and chipsets, the user-visible features of the Core i3 are largely unchanged, including the lack of support for Turbo Boost and AES-NI. Unlike the Sandy Bridge-based Celeron and Pentium processors, the Core i3 line does support the new Advanced Vector Extensions. This particular processor is the entry-level processor of this new series of Intel processors. In January 2011, Intel released new quad-core Core i5 processors based on the "Sandy Bridge" microarchitecture at CES 2011. New dual-core mobile processors and desktop processors arrived in February 2011. The Core i5-2xxx line of desktop processors are mostly quad-core chips, with the exception of the dual-core Core i5-2390T, and include integrated graphics, combining the key features of the earlier Core i5-6xx and Core i5-7xx lines. The suffix after the four-digit model number designates unlocked multiplier (K), low-power (S) and ultra-low-power (T). The desktop CPUs now all have four non-SMT cores (like the i5-750), with the exception of the i5-2390T. The DMI bus is running at 5 GT/s. The mobile Core i5-2xxxM processors are all dual-core and hyper-threaded chips like the previous Core i5-5xxM series, and share most of the features with that product line. The Core i7 brand was the high-end for Intel's desktop and mobile processors, until the announcement of the i9 in 2017. Its Sandy Bridge models feature the largest amount of L3 cache and the highest clock frequency. Most of these models are very similar to their smaller Core i5 siblings. The quad-core mobile Core i7-2xxxQM/XM processors follow the previous "Clarksfield" Core i7-xxxQM/XM processors, but now also include integrated graphics. Ivy Bridge is the codename for a "third generation" line of processors based on the 22 nm manufacturing process developed by Intel. Mobile versions of the CPU were released on April 2012 following with desktop versions on September 2012. The Ivy Bridge-based Core-i3-3xxx line is a minor upgrade to 22 nm process technology and better graphics. Haswell is the fourth generation Core processor microarchitecture, and was released in 2013. Broadwell is the fifth generation Core processor microarchitecture, and was released by Intel on September 6, 2014, and began shipping in late 2014. It is the first to use a 14 nm chip. Additionally, mobile processors were launched in January 2015 and Desktop Core i5 and i7 processors were released in June 2015. Skylake is the sixth generation Core processor microarchitecture, and was launched in August 2015. Being the successor to the Broadwell line, it is a redesign using the same 14 nm manufacturing process technology; however the redesign has better CPU and GPU performance and reduced power consumption. Intel also disabled overclocking non -K processors. Kaby Lake is the seventh generation Core processor microarchitecture, and was launched in October 2016 (mobile chips) and January 2017 (desktop chips). With the latest generation of microarchitecture, Intel decided to produce Kaby Lake processors without using their "tick–tock" manufacturing and design model. Similar to Skylake, Kaby Lake processors are produced using a 14 nanometer manufacturing process technology. Built on an improved 14 nm process (14FF+), Kaby Lake features faster CPU clock speeds, clock speed changes, and higher Turbo frequencies. Beyond these process and clock speed changes, little of the CPU architecture has changed from Skylake, resulting in identical IPC. Kaby Lake features a new graphics architecture to improve performance in 3D graphics and 4K video playback. It adds native HDCP 2.2 support, along with fixed function decode of H.264, HEVC Main and Main10/10-bit, and VP9 10-bit and 8-bit video. Hardware encode is supported for H.264, HEVC Main10/10-bit, and VP9 8-bit video. VP9 10-bit encode is not supported in hardware. OpenCL 2.1 is now supported. Kaby Lake is the first Core architecture to support hyper-threading for the Pentium-branded desktop CPU SKU. Kaby Lake also features the first overclocking-enabled i3-branded CPU. Premium 2 (4) Core i7 7660U 2.5 GHz 4.0 GHz ? Iris Plus 640 300 MHz 1100 MHz 4 MB 64 MB 12 15 W N/A 9.5 W Q1 2017 ? 7567U 3.5 GHz 4.0 GHz Iris Plus 650 64 MB 28 W N/A 23 W ? Mainstream Core i5 7360U 2.3 GHz 3.6 GHz Iris Plus 640 1000 MHz 4 MB 64 MB 12 15 W N/A 9.5 W Q1 2017 ? 7287U 3.3 GHz 3.7 GHz Iris Plus 650 4 MB 64 MB 28 W N/A 23 W ? Core i3 7167U 2.8 GHz N/A Iris Plus 650 1000 MHz 3 MB 64 MB 12 28 W N/A 23 W Q1 2017 ? Coffee Lake is the eighth generation Intel Core micro-architecture and was launched in October 2017. For the first time in the ten year history of Intel Core processors, the Coffee Lake generation features an increase in core counts across the desktop lineup of processors, a significant driver of improved performance versus previous generations despite similar per-clock performance. Following similar refinements to the 14 nm process in Skylake and Kaby Lake, Coffee Lake is the third 14 nm process refinement ("14nm++") and features increased transistor gate pitch for a lower current density and higher leakage transistors which allows higher peak power and higher frequency at the expense of die area and idle power. Coffee Lake will be used in conjunction with the 300-series chipset and is incompatible with the older 100- and 200-series chipsets. The 9th generation Coffee Lake CPUs were released in the fourth quarter of 2018. They include hardware mitigations against certain Meltdown/Spectre vulnerabilities. For the first time in Intel consumer CPU history, these CPUs support up to 128GB RAM. Even though the F suffix CPUs lack an integrated GPU, Intel set the same price for these CPUs as their featureful counterparts. * various reviews show that the Core i9 9900K CPU may consume over 140W under load. Cannon Lake (formerly Skymont) is Intel's codename for the 10-nanometer die shrink of the Kaby Lake microarchitecture. As a die shrink, Cannon Lake is a new process in Intel's "process–architecture–optimization" execution plan as the next step in semiconductor fabrication. Cannon Lake are the first mainstream CPUs to include the AVX-512 instruction set. In comparison to the previous generation AVX2 (AVX-256), the new generation AVX-512 most notably provides double the width of data registers and double the number of registers. These enhancements would allow for twice the number of floating point operations per register due to the increased width in addition to doubling the overall number of registers, resulting in theoretical performance improvements of up to four times the performance of AVX2. At CES 2018, Intel announced that they had started shipping mobile Cannon Lake CPUs at the end of 2017 and that they would ramp up production in 2018. No further details were disclosed. Core i3 8121U 2 (4) 2.2 GHz 3.2 GHz N/A 4 MB 15 W N/A ? Ice Lake is codename for Intel's 10th generation microarchitecture, representing an enhancement of the 'Architecture' of the preceding generation Kaby Lake/Cannon Lake processors (as specified in Intel's process–architecture–optimization execution plan). With Cannon Lake having successfully moved from a 14 nm to 10 nm manufacturing process, Ice Lake is also expected to feature an enhanced 10 nm process (10 nm+). Ice Lake will be the first Intel CPU to feature in-silicon mitigations for the hardware vulnerabilities discovered in 2017, Meltdown and Spectre. These side-channel attacks exploit branch prediction's use of speculative execution. These exploits may cause the CPU to reveal cached private information which the exploiting process is not intended to be able to access as a form of timing attack. ^ "Desktop Processors". Intel. Archived from the original on December 5, 2010. Retrieved December 13, 2010. ^ "Intel announces Core X line of high-end processors, including new Core i9 chips". The Verge. Archived from the original on May 30, 2017. Retrieved May 30, 2017. ^ Gibbs, Samuel (January 3, 2018). "Major security flaw found in Intel processors". Theguardian.com. Archived from the original on January 4, 2018. Retrieved January 5, 2018 – via www.TheGuardian.com. ^ "How to protect your PC against the major 'Meltdown' CPU security flaw". TheVerge.com. January 4, 2018. Archived from the original on January 5, 2018. Retrieved January 5, 2018. ^ Metz, Cade; Perlroth, Nicole (January 5, 2018). "Researchers Discover Two Major Flaws in the World's Computers". Nytimes.com. Archived from the original on January 3, 2018. Retrieved January 5, 2018 – via NYTimes.com. ^ "INTEL-SA-00161". Intel. Retrieved August 17, 2018. ^ "Foreshadow: The Sky Is Falling Again for Intel Chips". Hackaday.com. August 14, 2018. Retrieved August 17, 2018. ^ "Critical Flaw Undermines Intel CPUs' Most Secure Element". Wired.com. Retrieved August 17, 2018. ^ "Intel launches three Core M CPUs, promises more Broadwell "early 2015"". Ars Technica. Archived from the original on January 5, 2015. ^ "Intel Launches Devil's Canyon and Overclockable Pentium: i7-4790K, i5-4690K and G3258". Anandtech. June 3, 2014. Archived from the original on June 28, 2014. Retrieved June 29, 2014. ^ "Intel already phasing out first quad-core CPU". TG Daily. Archived from the original on September 13, 2007. Retrieved September 7, 2007. ^ "Intel to discontinue older Centrino CPUs in Q1 08". TG Daily. Archived from the original on November 2, 2007. Retrieved October 1, 2007. ^ "Support for the Intel Core Solo processor". Intel. Archived from the original on April 19, 2010. Retrieved December 13, 2010. ^ "Support for the Intel Core Duo Processor". Intel. Archived from the original on April 17, 2010. Retrieved December 13, 2010. ^ "Intel Microarchitecture". Intel. Archived from the original on June 12, 2009. Retrieved December 13, 2010. ^ "Intel Core2 Solo Mobile Processor – Overview". Intel. Archived from the original on September 26, 2011. Retrieved December 13, 2010. ^ "Intel Core2 Duo Processor: Upgrade Today". Intel. Archived from the original on January 7, 2011. Retrieved December 13, 2010. ^ "Intel Core2 Duo Mobile Processor". Intel. Archived from the original on April 3, 2009. Retrieved December 13, 2010. ^ "Intel Core2 Quad Processor Overview". Intel. Archived from the original on March 6, 2011. Retrieved December 13, 2010. ^ "Intel Core2 Quad Mobile Processors – Overview". Intel. Archived from the original on May 6, 2015. Retrieved December 13, 2010. ^ "Support for the Intel Core2 Extreme Processor". Intel. Archived from the original on March 16, 2010. Retrieved December 13, 2010. ^ "Intel Core2 Extreme Processor". Intel. Archived from the original on February 21, 2011. Retrieved December 13, 2010. ^ "Intel Microarchitecture Codenamed Nehalem". Intel. Archived from the original on July 22, 2010. Retrieved December 13, 2010. ^ "Public Roadmap Desktop, Mobile & Data Center" (PDF). Intel. Archived from the original (PDF) on February 5, 2009. Retrieved December 13, 2010. ^ "Intel Processor Ratings". Intel. Archived from the original on April 15, 2011. Retrieved July 21, 2011. ^ "Processor Ratings". Intel. July 9, 2010. Archived from the original on January 1, 2011. Retrieved December 13, 2010. ^ "Intel Quietly Announces Core i5 and Core i3 Branding". AnandTech. Archived from the original on March 23, 2010. Retrieved December 13, 2010. ^ "Intel confirms Core i3 as 'entry-level' Nehalem chip". Apcmag.com. September 14, 2009. Archived from the original on July 22, 2011. Retrieved December 13, 2010. ^ "Core i5 and i3 CPUs With On-Chip GPUs Launched". Hardware.slashdot.org. January 4, 2010. Archived from the original on January 12, 2012. Retrieved December 13, 2010. ^ "Intel May Unveil Microprocessors with Integrated Graphics Cores at Consumer Electronics Show". Xbitlabs.com. Archived from the original on October 30, 2010. Retrieved December 13, 2010. ^ "Intel to launch four Arrandale CPUs for mainstream notebooks in January 2010". Digitimes.com. November 13, 2009. Archived from the original on December 7, 2010. Retrieved December 13, 2010. ^ "Intel Core i3 Desktop Processor — Frequently Asked Questions". Intel. Archived from the original on September 25, 2011. ^ "FAQ Entry - Online Support - Support - Super Micro Computer, Inc". www.Supermicro.com. Archived from the original on July 2, 2017. Retrieved January 5, 2018. ^ "SPCR • View topic – ECC Support (offshoot of Silent Server Build)". silentpcreview.com. Archived from the original on January 5, 2012. ^ Asus P8B WS specification Archived September 25, 2011, at the Wayback Machine: supports "ECC, Non-ECC, un-buffered Memory", but "Non-ECC, un-buffered memory only support for client OS (Windows 7, Vista and XP)." ^ "Support for the Intel Core i5 Processor". Intel. Archived from the original on April 11, 2010. Retrieved December 13, 2010. ^ DIGITIMES. "Login to DIGITIMES archive & research". www.digitimes.com. Archived from the original on March 20, 2016. Retrieved May 7, 2018. ^ "Intel 奔腾双核 E5300(盒) 资讯-CPU 资讯-新奔腾同现身 多款Core i5、i3正式确认-IT168 diy硬件". it168.com. Archived from the original on October 9, 2011. ^ "Intel® Core i5 Desktop Processor — Integration, Compatibility, and Memory FAQ". Intel. Archived from the original on February 11, 2012. ^ "Intel Core i5-430UM Mobile processor – CN80617006042AE". cpu-world.com. Archived from the original on August 12, 2011. ^ "Support for the Intel Core i7 Processor". Intel. Archived from the original on November 29, 2010. Retrieved December 13, 2010. ^ Modine, Austin (November 18, 2008). "Intel celebrates Core i7 launch with Dell and Gateway". The Register. Archived from the original on December 20, 2008. Retrieved December 6, 2008. ^ "IDF Fall 2008: Intel un-retires Craig Barrett, AMD sets up anti-IDF camp". Tigervision Media. August 11, 2008. Archived from the original on March 19, 2012. Retrieved August 11, 2008. ^ "Meet the Bloggers". Intel Corporation. Archived from the original on March 19, 2012. Retrieved August 11, 2008. ^ "Getting to the Core – Intel's new flagship client brand". Intel Corporation. Archived from the original on August 18, 2008. Retrieved August 11, 2008. ^ "[Intel Roadmap update] Nehalem to enter mainstream market". ExpReview. June 10, 2008. Archived from the original on March 19, 2012. Retrieved August 11, 2008. ^ "Intel Details Upcoming New Processor Generations" (Press release). Intel Corporate. August 11, 2008. Archived from the original on October 6, 2009. ^ "Intel Core i7-920 Processor (8M Cache, 2.66 GHz, 4.80 GT/s Intel QPI)". Intel. Archived from the original on December 8, 2008. Retrieved December 6, 2008. ^ "Intel Core i7-940 Processor (8M Cache, 2.93 GHz, 4.80 GT/s Intel QPI)". Intel. Archived from the original on December 6, 2008. Retrieved December 6, 2008. ^ "Intel Core i7-965 Processor Extreme Edition (8M Cache, 3.20 GHz, 6.40 GT/s Intel QPI)". Intel. Archived from the original on December 7, 2008. Retrieved December 6, 2008. ^ "Getting to the Core – Intel's new flagship client brand". Technology@Intel. Archived from the original on August 18, 2008. ^ "Intel Haswell-E Core i7-5960X, Core i7-5930K, Core i7-5820K Specifications Unveiled – Flagship 8 Core To Boost Up To 3.3 GHz". Archived from the original on June 13, 2015. Retrieved June 12, 2015. ^ "Intel Discloses Newest Microarchitecture and 14 Nanometer Manufacturing Process Technical Details". Intel. Intel Corporation. August 11, 2014. Archived from the original on August 26, 2014. Retrieved September 6, 2014. ^ "Intel launched U-series Broadwell processors". January 10, 2015. Archived from the original on February 15, 2015. Retrieved February 15, 2015. ^ a b c "Intel's Broadwell goes broad with new desktop, mobile, server variants – The Tech Report – Page 1". techreport.com. Archived from the original on June 12, 2015. Retrieved June 11, 2015. ^ "Intel begins shipping Kaby Lake CPUs to manufacturers". The Tech Report. Archived from the original on January 26, 2017. Retrieved January 21, 2017. ^ "Intel pushes out the rest of its Kaby Lake processors for 2017's PCs". Ars Technica. Archived from the original on January 21, 2017. Retrieved January 21, 2017. ^ a b "Intel Kaby Lake details: The first post-"tick-tock" CPU architecture". Ars Technica UK. Archived from the original on January 6, 2017. Retrieved January 21, 2017. ^ "Intel Coffee Lake Core i7-8700K review: The best gaming CPU you can buy". Ars Technica. Archived from the original on October 5, 2017. Retrieved October 5, 2017. ^ "Intel Core i7-8700K Review: The New Gaming King". TechSpot. Archived from the original on October 5, 2017. Retrieved October 5, 2017. ^ "Intel 300-series chipsets to provide USB 3.1 Gen2 and Gigabit Wi-Fi | KitGuru". www.kitguru.net. Archived from the original on May 6, 2017. Retrieved April 29, 2017. ^ Cutress, Ian. "The AnandTech Coffee Lake Review: Initial Numbers on the Core i7-8700K and Core i5-8400". p. 3. Archived from the original on October 5, 2017. Retrieved October 6, 2017. ^ a b Cutress, Ian (June 11, 2018). "The Intel Core i7-8086K Review". ^ "Intel Announces 9th Generation Core CPUs, Eight-Core Core i9-9900K". Tom's Hardware. 2018-10-08. Retrieved 2018-10-09. ^ "Intel announces its latest 9th Gen chips, including its 'best gaming processor' Core i9". The Verge. Retrieved 2018-10-09. ^ Cutress, Ian. "Intel to Support 128GB of DDR4 on Core 9th Gen Desktop Processors". Retrieved 2018-10-15. ^ Cutress, Ian. "Intel's Graphics-Free Chips Are Also Savings-Free: Same Price, Fewer Features". Retrieved 2019-01-16. ^ Cuttress, Ian (October 8, 2018). "Intel Announced 9th Gen Core CPUs: Core i9-9900K (8-Core), i7-9700K, & i5-9600K". AnandTech. Retrieved October 8, 2018. ^ "Intel Core i9 9900K processor review". Guru3D.com. Retrieved 2018-10-19. ^ Cutress, Ian. "The Intel 9th Gen Review: Core i9-9900K, Core i7-9700K and Core i5-9600K Tested". Retrieved 2018-10-19. ^ "Intel Core i9-9900K Review". TechPowerUp. Retrieved 2018-10-19. ^ "Power Consumption - Intel Core i9-9900K 9th Gen CPU Review: Fastest Gaming Processor Ever". Tom's Hardware. 2018-10-19. Retrieved 2018-10-21. ^ "Intel's Cannonlake 10nm Microarchitecture is Due For 2016 - Compatible On Union Bay With Union Point PCH". WCCFTech. June 6, 2014. Archived from the original on October 6, 2014. Retrieved September 24, 2014. ^ "Intel® Advanced Vector Extensions 512 (Intel® AVX-512) Overview". Intel. Archived from the original on March 2, 2018. Retrieved March 2, 2018. ^ "What Is Intel AVX-512 and Why Does It Matter? | Prowess Consulting". www.prowesscorp.com. Archived from the original on March 2, 2018. Retrieved March 2, 2018. ^ Cutress, Ian. "Intel Mentions 10nm, Briefly". Archived from the original on January 10, 2018. Retrieved January 10, 2018. ^ "Intel Announces 10nm Cannon Lake Is Shipping". Tom's Hardware. January 9, 2018. Retrieved January 10, 2018. ^ "Intel Core i3-8121U SoC - Benchmarks and Specs". Notebookcheck. Retrieved May 14, 2018. ^ Kampman, Jeff (May 15, 2018). "Cannon Lake Core i3-8121U appears in Intel's ARK database". Tech Report. Retrieved May 15, 2018. Wikimedia Commons has media related to Intel Core 2 Duo, Intel Core 2 Quad, Intel Core i5 and Intel Core i7. Intel Core Duo (Yonah) Performance Preview – Part II vs AMD 64 X2 and Intel Pentium M. Anandtech. Intel Core i7-3960X CPU Performance Comparison. Intel Centrino Duo Mobile Technology papers. Intel.